MachineMetrics’ system is designed so that customers can install it themselves without the need for expensive and time-consuming customization. Once installed, manufacturers can collect, visualize, and analyze data from any industrial machine. Photo courtesy of MachineMetrics/PR Newswire. BOSTON—MachineMetrics, which equips factories with the digital tools needed to increase productivity and win more business, recently announced that it raised $11.3 million in Series A financing. Tola Capital led the round with participation from existing investors Hyperplane Venture Capital, Long River Ventures, Mass Ventures, Hub Angels. and Firebolt Ventures. MachineMetrics will use the new funds to expand its data science and product development teams while accelerating global sales, the company said in a press release. MachineMetrics (www.machinemetrics.com) is a pioneer in Industrial IoT (Internet of Things) technology. Its system is designed so that customers can install it themselves without the need for expensive and time-consuming customization. Once installed, manufacturers can collect, visualize, and analyze data from any industrial machine. The system automatically senses when there is a problem—predicting some problems hours or minutes before they occur—and recommends solutions that reduce costly unplanned outages. MachineMetrics also benchmarks a company’s machine performance against those of their peers to help guide future investments. Integrated into factories globally, MachineMetrics serves customers such as Fastenal, Snap-On Tools, National Oilwell Varco, Gardner Denver, Continental, Saint Gobain, Shiloh Automotive, and SECO Tools. 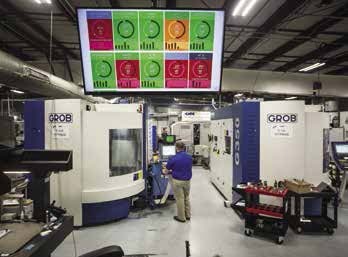 The company’s latest software allows factory workers to share MachineMetrics’ data with their remote maintenance teams and makers of their equipment, and vice versa. This enables service teams to identify problems through remote diagnosis, reduce onsite service visits by 10 to 20 percent, and receive predictive maintenance alerts, which could lead to new business. Manufacturing accounts for 16.6 percent of global GDP and is on the brink of a new digital age, often called the Fourth Industrial Revolution. That revolution combines two advancements — predictive analytics and artificial intelligence — and applies them to physical objects (such as a Nest thermostat), creating the Internet of Things.